The New Year will be here sooner than you think. Many people each year resolve to lose weight, exercise more, read more, save more money, or otherwise improve some area of their life. 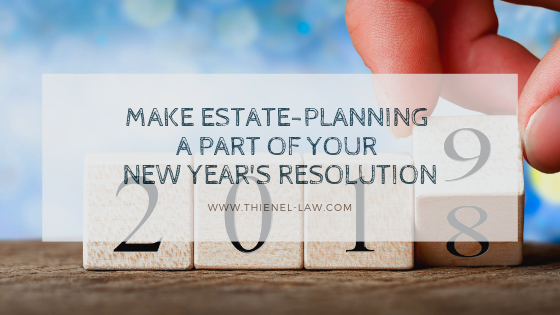 This New Year’s Day, why don’t you resolve to make estate planning a priority during 2019. If you have an estate plan, resolve to review the plan with your Maryland estate-planning attorney. If you have no estate plan, resolve to devise an estate plan in 2019 that reflects your wishes and desires for your future and your family. · Do you have an estate plan? If you have no estate plan, make one now! A Maryland estate-planning attorney can help you determine your needs and goals for an estate plan and then put together a comprehensive estate plan to achieve those goals. · Have you had any life events or changes in your financial situation since you drafted your will and other estate documents? Life events such as divorce, marriage, loss of a spouse or other heir, the birth of a child, new business, receipt of an inheritance, etc. should trigger an estate review. Any major change in your life can have a significant impact on your estate plan. As you prepare to review your estate plan, make a list of the changes since you last updated your estate plan to help you assess what changes are necessary. Life events such as divorce, marriage, loss of a spouse or other heir, the birth of a child, new business, receipt of an inheritance, etc. should trigger an estate review. · Review your will. Your will is an important document and essential for an effective estate plan. Review the terms of your will to ensure the terms still represent what you desire for your final affairs. · Review other estate documents such as trust agreements and powers of attorney. The Tax Cut and Jobs Act (TCJA) may affect whether you use trust agreements or other estate planning tools. Review all estate planning documents with a Maryland estate-planning attorney to determine if you can make any changes that would benefit your heirs. · Review your beneficiary designations. Some assets pass directly to beneficiaries outside of your estate. Review your beneficiary designations for life insurance policies, retirement accounts, annuities, and other assets with beneficiaries to ensure your choices still reflect your current wishes. · Consider who you appointed to serve as your Personal Representative, Trustee, Power of Attorney, or other agents. The person or persons you choose as your agent, trustee, or administrator should understand your wishes for your estate. Be able to trust these individuals to carry out and enforce your wishes in your estate plan. · Do you have the medical authorizations you need? Do you have a Health Care Power of Attorney, Living Will, Medical Directive, and other documents in place that designate an agent to make medical and health care decisions for you if you are incapacitated? If not, you need to discuss these documents with your Maryland estate-planning attorney to determine how you want to handle health care matters if you cannot speak for yourself. Estate planning need not be difficult or overwhelming. An estate plan allows you torest easier knowing you have taken the necessary steps to protect your property and your loved ones. A Maryland estate-planning attorney can help you draft or review your estate plan. Contact Thienel Law today to schedule a time to review your estate plan soon. Maryland estate-planning lawyer Steve Thienel is dedicated to assisting clients in Maryland, Virginia, and throughout the DC Metro area. Older PostDo You Owe Back Taxes? Here's What You Can Do To Get The IRS to Go Easy on You.